Maryland Football Coach Stays, President Goes, After Player's Death The university system's board of regents said it would implement all the recommendations from an independent commission's study that found problems in the culture of its football program. 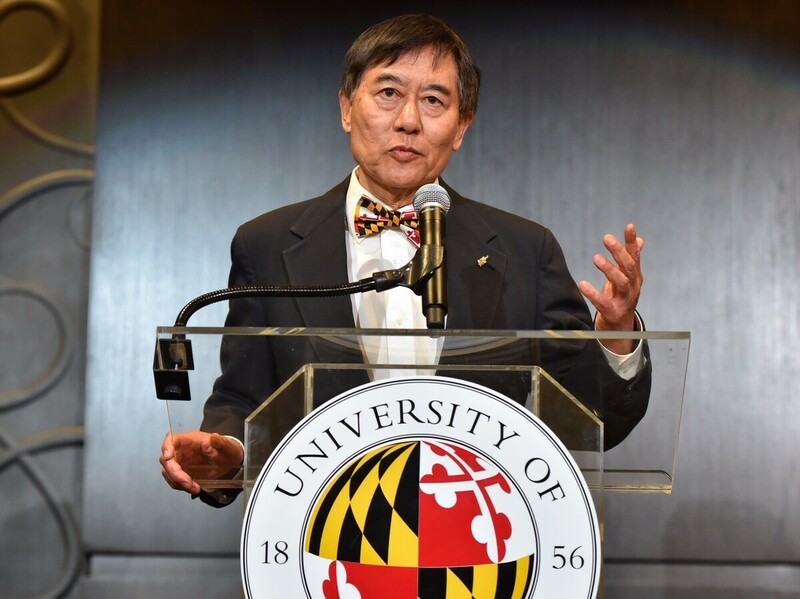 University of Maryland President Wallace Loh, seen here in August, said Tuesday that he will retire in June 2019. Five months after the death of University of Maryland football player Jordan McNair, the university system's board of regents has decided that football coach DJ Durkin and athletic director Damon Evans can both keep their jobs. University President Wallace Loh, however, will retire in June. At a press conference in Baltimore on Tuesday, Chairman of the Board of Regents James Brady said that the board had accepted all of the findings and recommendations from an independent commission's study on the culture of the university's football program. That report, released publicly last week, found that the program did not have a "toxic" culture, but was an environment where problems festered because many players feared speaking out. Brady said that the commission had interviewed many people about Durkin, and admitted that many were critical of the coach and his leadership style. But others, he said, spoke with affection for him. After meeting with the coach, who has been on administrative leave since August, the regents decided that he should be allowed to keep his job. "We believe that Coach Durkin has been unfairly blamed for the dysfunction in the athletic department. And while he shares some responsibility, it is not fair to place all of it at his feet," Brady said. "We believe that he is a good man, and a good coach who is devoted to the well-being of student athletes under his charge. He is also at the beginning of his coaching career, with a great deal of promise, and much still to learn. We believe he deserves that opportunity." Loh, the university president since November 2010, said the regents had asked him to "steer the ship to calmer waters" by implementing reforms including improving the culture of the football program. "In August, I accepted legal and moral responsibility for the mistakes that were made in the diagnosis and treatment of Jordan McNair," Loh said Tuesday. "Today I stand by that statement 100 percent. And I will do everything possible to fulfill that responsibility." As NPR's Vanessa Romo previously reported, McNair, 19, "died two weeks after collapsing from heatstroke during practice on May 29. He reportedly had a temperature of 106 and was hospitalized following the incident. But a McNair family attorney said the team personnel was slow to seek medical attention. According to ESPN, they waited an hour after the offensive lineman suffered a seizure before calling 911." Rick Court, the strength and conditioning coach who was leading McNair's last workout, resigned in August. The Washington Post reports that when Durkin rejoined the team in a meeting on Tuesday afternoon, multiple players walked out. Some players, parents and boosters had called for Durkin's firing, including McNair's father. "He shouldn't be able to work with anybody else's kid," Martin McNair said in August. In statement Tuesday afternoon, Athletic Director Damon Evans said the university would implementing every recommendation of the external commission. "We have committed to doing everything in our power to make sure something like this never happens again, and that all of our student-athletes have a supportive environment."